Please select a Lens & Type to view availability. Nowadays it is quite common to use a retractable sun-visor that is situated between the helmet’s outer- and inner shell to protect against sun glare. 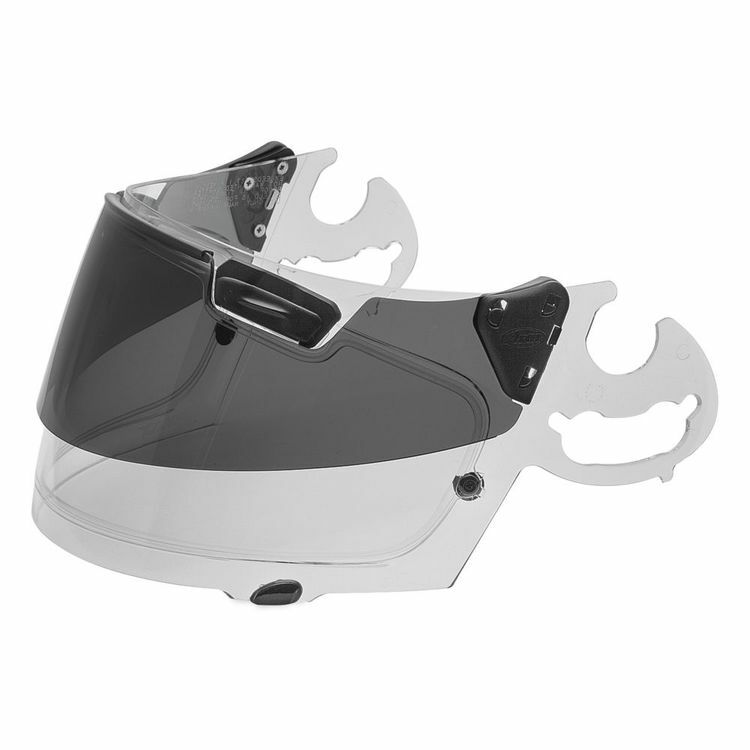 However, it is Arai’s opinion that this construction could affect the performance of a helmet during impact. As the Pro Shade System is completely mounted on the outside of the helmet, it will not in any way negatively affect the performance of the helmet. The Pro Shade System is a small peak that is locked in position. Unlocking is easy; just pull the Pro Shade System forward, then it can be flipped down with a flick of the hand to act as an effective sun-visor. The Pro Shade System is the complete all-weather system for serious touring riders, offering protection against sun glare, fogging and misting, especially for riders that prefer an upright seating position and/or the comfort of a fairing, the Pro Shade System will enhance the rider’s comfort significantly. I love my Arai Corsair helmet. Far and away the best fitting most comfortable helmet that I have ever owned. The one drawback has always been the lack of protection from the sun. I tried the pinlock Photochromic insert but that always reacted too slowly when I needed it and never seemed to darken enough. When I first saw the ProV shield I thought it would be noisy and did not seem a very elegant solution. I bought one anyway and have been very pleased with the results. I have been using it for six months without any issues. Noise levels feel the same and the mechanism for pushing and pulling the dark visor up or down works so well you just forget about it. For me this was the solution I have been looking for. High Quality, but needs 2-hands to operate? Shade locks securely into up or down position, and moving from one to the other works well with 2 hands. When riding, I want to move the shade without stopping, and I find it difficult to lock/unlock the mechanism with one hand. Otherwise, this is a nice product. Blocks the sun well enough but it's finicky to operate. Pull out-up-and back to open and lock in place and pull forward and down to close. Requires my hand to be off the handlebar longer than necessary. Brow vent sliders do feel a little cheap too. The SAI shields operation in general leaves some to be desired in my opinion. I really like the sun protection provided by the smoke visor. However, in windy conditions, neither the shield nor the visor will stay up. That is even as I'm riding my GoldWing. That makes riding at night in cross winds really awkward. The only real solution is to take the visor off. Unfortunately, the clips that hold the visor on are small and very easy to lose. I really cannot recommend it at this price level. The best of both in my opinion. A hidden advantage to the standard size is the ability to screen the sun up top but, leaving the bottom clear makes checking mirrors easier to see. I commute a ton and will often go to work in the daylight and return after dark or vice versa. I got tired of wearing sunglasses with a clear shield and being blind at night with my dark shield. I didn't like carrying an extra shield with me everywhere. This is an imperfect compromise, but I like it okay. The good: the added wind resistance and noise is surprisingly small and I can now use the same shield for the way to and from work. The bad: eyebrow vents are cheap, the tinted part does not cover enough of your face and eyes especially on the side. I don't regret the purchase. It's a good tradeoff in my opinion if you want to stick with Arai. I really like this Arai Pro Shade shield, the shield is dark enough that the sun does not bother me at all, when the sun goes down you just lift the dark shield and you now use just the clear shield super simple system that just works. One thing I did find is when you have the dark shield in the raised position it acts like a scoop for the air vents on the top of the RX-Q helmet and you can feel more air being directed into the two air intakes. The dark shield while in the raised position does not effect the stability of the helmet at all, I can't tell a difference when the shield is down vs when the shield is up, so stability is not effected when the dark shield is in the raised position. I just purchased a Corsair X helmet and I ordered the Pro Shade System for that helmet as well. Excellent piece of equipment. I have had both regular and long sized shade system shields. The longer version is better but both are good. I really wanted to like the Proshade system, but it just does not meet expectations. I like to ride with the visor slightly cracked open just a bit for more air flow. Cant do this with the Proshade. The weight of the shield and the lack of detents keeps it closed completely. There is also a noticeable glare between the shade and the shield in sunlight. I will pass on the Proshade system and continue with the standard Arai dark shield for my Signet Q.